To ensure our employees are providing exceptional and compassionate care, members of our management team visit patients daily to ensure that our care meets patient expectations. They ask our patients key questions to assess the quality of our care, the timeliness of our response, and how well we are controlling their pain. This also allows us to answer any questions or concerns our patients may have which ensures they are enjoying their stay as much as possible. 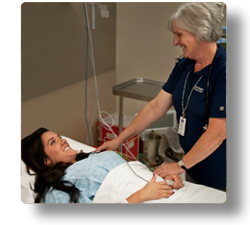 The bottom line at Davis Hospital is - we care about our patients. We have several programs in place to ensure our patients are receiving phenomenal care. One of those programs is the STAR Power Card program which allows patients and their families to recognize staff for delivering great care and customer service. We also have a patient concierge who is dedicated to working with our patients, their families and guests. The reason I love working for Davis Hospital is because I enjoy being a part of something meaningful. My job is critical to improving the hospital culture and I get to expand my skills by being the customer service specialist. My job is more rewarding than I could have ever hoped for. Even though I don’t have a direct impact on the care for patients, it’s very rewarding to me to know that I can help people understand their health options and get the best care available to them. One of the things I love most about my job is being involved in the community and supporting local businesses, schools and fundraisers. I would highly recommend someone to consider a position with Davis Hospital because Davis is an employer who provides opportunities for growth in your career and goes the extra mile to provide you with the feeling of being part of a “Family”. They always make you feel like you are a valuable part of their team. What I enjoy most about working for Davis Hospital is the caring attitude and professionalism I see daily towards the employees and patients. The atmosphere is full of energy which involves teamwork and a commitment to our hospital goals.